You can pick your beer. But can you pick… a Lock? Join us on Saturday, September 8th, from 5-7pm as we embark on an ancient mechanical adventure to explore the inner workings of a modern lock, first developed by the Mesopotamians and Egyptians over 4000 years ago. 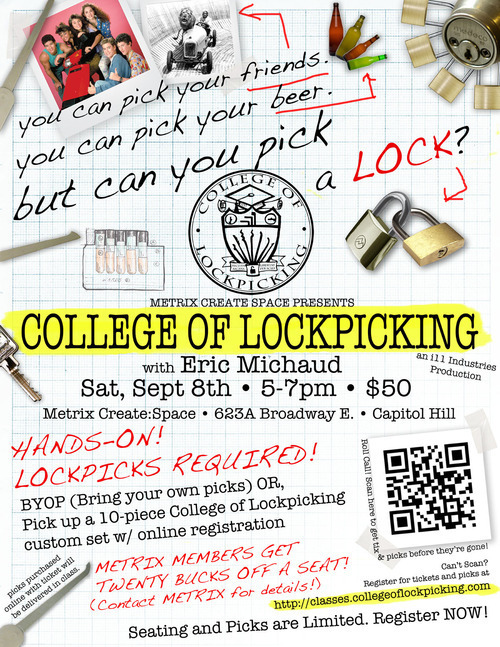 Led by lockpicker Eric Michaud, this workshop will cover - soup to nuts - everything you need to know about how common locks work… and how to pick them open. Whether you’re a complete novice curious to find out what pin-tumbler really means, a homeowner protecting your family’s treasures, or a veteran lockpicker with questions about advanced locks and techniques, this event is for you! With 2 solid hours of history, mechanical diagrams (“lock pr0n”), and hands-on lockpicking instruction… first we’ll open your minds, and then we’ll open some locks! To properly learn this ancient art, you will need the proper tools. By registering for a ticket with a lockpick set, this guarantees you a seat at the workshop, and reserves - all for you - a brand-new 10-piece custom lockpick made entirely in the USA, hand-pickedby College of Lockpicking faculty to maximize utility for beginners and locksport enthusiasts alike, and offered for only $30. If you already have some picks you’re itching to practice with, you can bring them along and your workshop cost is only $50!